Pepin the Short died in 768. Shortly before his death he decided that his son Charles would rule over Austrasia and Neustria, while his other son, Carloman, was granted Burgundy, Provence and Septimania. The brothers didn’t reign uniformly and the conflict between them was worsened by the political situation that concerned state policies towards the Langobards. They married the daughters of the Langobard king Desiderius (756 – 776). Charles married Desiderata and Carloman’s wife was Gerberga. Early in his reign Charles was following the state policy of his grandfather, Charles Martel; therefore, a policy that saw the Langobards as allies. Nevertheless this alliance was not bearing fruit. After the death of Pope Paul I (767), the Langobard king showed his ambition to name his own candidate as the new Pope. He was ultimately unsuccessful but his relations with the Church suffered greatly. This led to Carloman intervening on behalf of the Church, stepping in as the defender of the church from the Langobards. Charles realized that Carloman is gaining church support in Frankia. He swiftly broke the alliance with the Langobards, divorced Desiderata and started working on better diplomatic relations with the Pope. Charles was in political isolation. Finally in 771 after the death of Carloman, Charles seized the lands that were rightfully belonging to his brother’s sons. Carloman’s wife returned to her father, taking her sons with her. Desiderius tried to gain the support of Pope Hadrian I (772 – 795). His ambition was to raise his grandson, the son of Carloman, on the Frankish throne. The Pope was unwilling, fearing Charles’s retaliation; therefore he called him for support against the Langobard king. Charles crossed the Alps in 774 and besieged Desiderius in Pavia. Charles used this opportunity to visit Rome, since the siege was taking time. The Pope named him patrician, while Charles confirmed the right on Patrimonium Sancti Petri; he confirmed the treaty that his father signed in 756. This treaty was the confirmation that the Ravenna Exarchate, the Duchy of Rome, Venice and Istria belonged to the Pope. Desiderius capitulated in 774, and he was confined (sent to a monastery) after this. 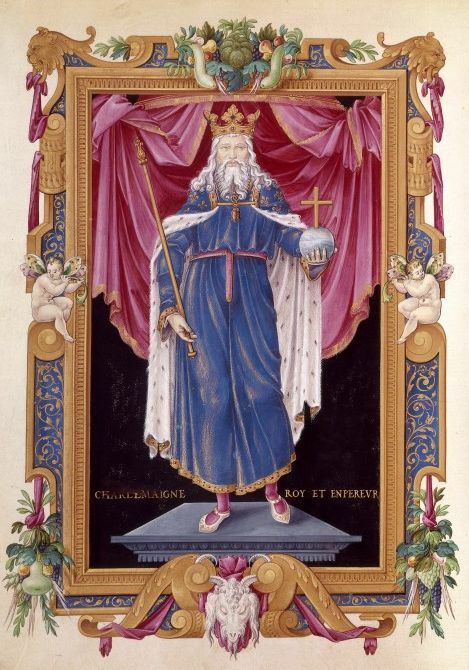 Charles proclaimed himself rex Francorum et Langobardorum. In 780 the Pope tried to annex the region of Tuscany, Spoleto, Benevento and Corsica. Charles hindered him by visiting Rome. To strengthen his rule in Italy, Charles named his son, Pepin, the king of Italy. It is important to note that Naples, Calabria, eastern Apulia and Sicily still were under Byzantine rule, while a Langobard duke reigned independently over Benevento. Charles conquered Benevento in 787; with this he endangered Byzantine interests in Italy. Therefore Byzantine Empress Irene or Irene Sarantapechaina (780 – 802) cancelled the betrothal of her son Constantine VI (780 – 797) with Rotrude, Charles’s daughter. War broke out but the situation remained unchanged, Benevento was still under Frankish rule while southern Italy remained in Byzantine hands. In the meantime Charles was campaigning on his borders over the Rhine and in the Danube region. The Saxons lived in the region that is located between the Ems and Elbe rivers. They were a group of tribes. The Westphalians lived in the West, while the Eastphalians settled in the East. The Engrians settled in the south while the Noralbingians settled to the North of the Elbe River mouth. These tribes were threatening the Frankish state in certain periods and the Frankish kings always had much difficulty in repelling their attacks. Charles Martel was largely unsuccessful in his campaign against the Saxons; Pepin the Short forced them to pay tribute (753 – 755); while Charlemagne gained total victory over them. In 772 Charlemagne led a campaign against the Engrians. The campaign ended in 776 with the subjugation and Christianization of Saxony. Nevertheless, only two years later in 778 the king of the Westphalians, Widukind, rebelled against the Franks, killed many of their supporters and drove the Christian priests out of Saxony. Charlemagne started a new campaign to punish the Saxons immediately. He annexed Saxony to Frankia after crushing the revolt. He divided Saxony into countships and placed loyal Saxons to rule them. But the king of Saxons Widikund was not discouraged by this; he raised new rebellions between 782 and 785. Charlemagne crushed these revolts and forced Widikund to subjugation and conversion to Christianity. Charlemagne ruled harshly in Saxony, in accordance with the law code Capitulatio de patribus Saxonicae. The law was that every rebel would face a death penalty. The harsh Frankish rule led to new Saxon rebellions. The rebellion of 794 was only quelled by Charlemagne after four campaigns and with the help of Saxon neighbors, the Obotrites. He deported Saxons into the inner parts of the Frankish state and established isolated settlements. Charlemagne confiscated their lands in Saxony and granted them to the Church, Frankish feudal lords and loyal Saxons. Since the laws from 785 proved to be too harsh, in 797 a new codex Capitulare Saxonicum was codified. Charlemagne brought the Saxon wars to an end with his campaign against the king Noralbingians (798 – 804). He granted their land to the Obotrites. In 540 Bavaria accepted Frankish rule for the first time. In 763, during the reign of Pepin the Short, the Bavarian duke Tassilo III had the ambition to gain Bavarian independence. He was defeated by Charlemagne in the battle near the river Lech (784); Tassilo had to swear fealty to Charlemagne again. He tried to organize an uprising against the Franks in 788 but he was captured and sentenced to death. Nevertheless, he was later pardoned and confined. Bavaria lost its autonomy. Charlemagne’s plan was to expand his rule to the south, in the region of Spain, where Abd al-Rahman, a descendant of the Umayyad dynasty, was ruling from 756. 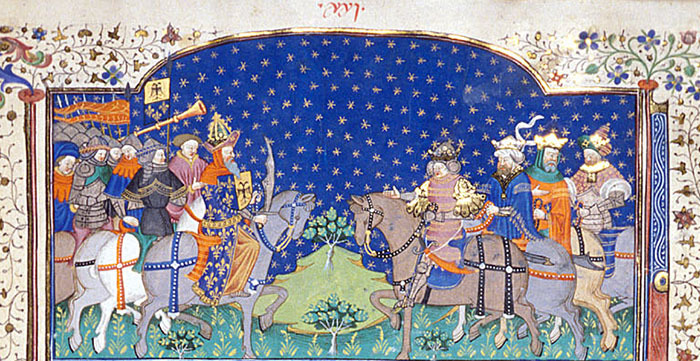 Charlemagne’s first campaign ended with a unsuccessful siege of Zaragoza (778). The retreating Frankish forces were attacked by the Basques. Roland, the prefect of the Breton march was slain in this battle. His death has been a motive for the so called Song of Roland (epic poem). The unsuccessful campaign against Spain encouraged Charlemagne to reorganize his rule in Aquitaine. He divided the land into two regions which were ruled by dukes. He named his third son Louis king of Aquitaine in 781 to preserve the image of his autonomy. 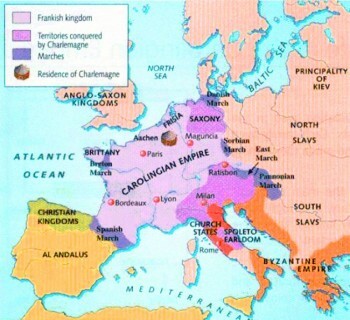 Charlemagne was ready for the second campaign in 795. By 812 he conquered the region that stretches from the Pyrenean Mountains to the Ebro River, which he united with Aquitaine as the Spanish march. 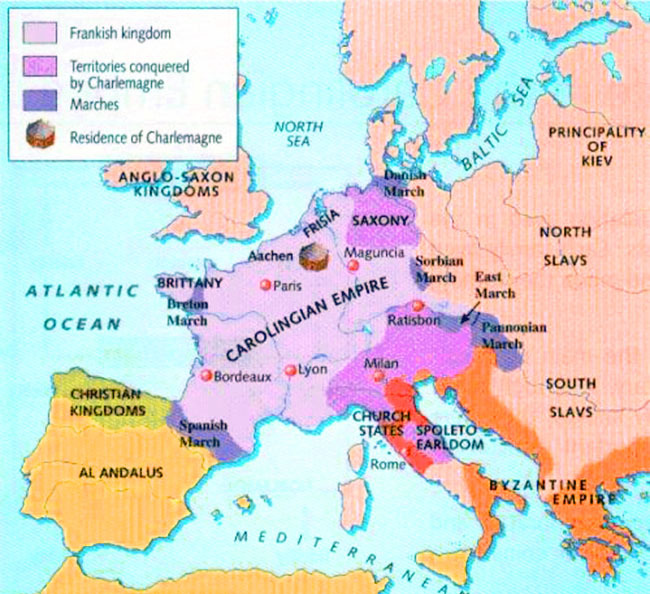 By the beginning of the ninth century Charlemagne united most of Western Europe under his rule. He ruled from Saxony to the north to the Pyreneans to the south. His friend Alcuin, the Abbot of the monastery of Saint Martin in Tours, used to repeat that Charles was sent by God himself to protect the Pope and the Christian faith during all his sermons. Pope Hadrian I died in 795. Leo III was named the new Pope, although he was facing accusations of leading a sinful life and that he is selling church titles. During one of his sermons in 799 the conspirators attacked him and almost trampled him to death. They tried to pull out his tongue and eyes but he was saved by the duke of Spoleto. This gave Charles the opportunity to step in as the protector of the Pope and to deal with his opposition. He stepped into the conflict as an arbiter. He invited the Pope to Paderborn to face the accusations, and sent two bishops to Rome to investigate. Since the accusations were deemed as false, the conspirators were convicted and taken to Frankia. Charles visited Rome in 800 where he was greeted with a special reception by the Pope. A council was called which decided that the Pope would clear himself from all accusations by taking a vow. In the meantime a delegation from Jerusalem, which was under siege at that time, brought Charles the banner and the keys of the holy city. On Christmas Eve (25.12.800) Charles went to the church of Saint Peter to pray. The Frankish annals state that everything that followed was not Charles’s intent; the Pope came up and crowned Charles. The Roman people greeted him three times as August and Emperor (see of the Romans. There was only one Empire and one Faith in the minds of the contemporary people. Byzantium was deemed as the only legitimate Empire; a new Rome that was the successor of the old Roman Imperium. The usual order of things was disturbed by Charles’s coronation. Rome itself was not fond of two Empires. The Pope hoped that Frankia would take the place of Byzantium. Nevertheless, by 800 there were two Empires; one in the East, and another one in the West (from the time of Roman Emperor Theodosius). Charles had to ask for the acknowledgement of Byzantium, without this consent the Empire had no legal foundation. In 802 Charlemagne sent an emissary to Empress Irena offering marriage, which would lead to the unification of East and West. Irena was dethroned when the delegation arrived and the new crowned Emperor was Nikephoros I (802 – 811), which took a negative stance towards the Pope and the Frankish ruler. In the meantime Charles was strengthening and stabilizing his rule. He captured Istria and Dalmatia during Irena’s reign and by 810 Venetia was under Frankish rule. Emperor Michael Rangabe (811 – 813) acknowledged Charles as Basileus over his envoy in Aachen, with the condition that the Franks return the captured territories. There were formally two empires now. Since the Frankish ruler was only confirmed as Emperor and not Emperor of the Romans, the Byzantine claim to the Roman throne was brought into question.